Abu Simbel This is the innermost sanctuary in the temple of Abu Simbel. During the later New Kingdom this would have been a very cool place, dark and a very quite as well . This was a very sacred place, Only priests would come here. Natural light reaches this room just twice a year. 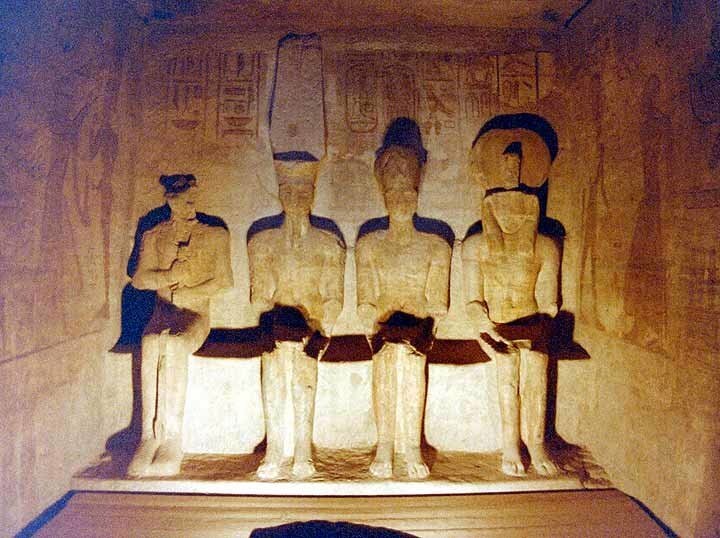 On February 21 and October 21 when the sun rises over the east bank of the Nile, a shaft of sunlight enters the opening in the facade of the temple, and travels 160 feet, past the Osiris pillars in the hypostyle hall, through a second hall, and into this man made cave where it illuminates the three figures on the right. The figure on the left remains in darkness. Though the monument was moved in the 1960’s AD, it was aligned so that this biannual solar event continues, although now it is one day later on the calendar. These are the most revered gods of Ramesses day. From right to left they are: Re-Harakhte of Heliopolis. Ramesses II sitting amoung the gods. He is wearing the battle crown or khepresh. The crown with the tall feathers is that of Amun-Re, from Thebes. Sitting to the far left, with the badly damaged head is Ptah from Memphis. One of Ptah’s attributes is that of darkness. Appropriately enough the sun never hits him, he remains in the shadows all year. Often on the monuments of ancient Egypt, you can see Pharaohs depicted in the afterlife as divine. But it is here, in this temple, that we first see a living Pharaoh being depicted as a god. Approaching The Temple of Nefertari.